The works of Makoto Shinkai have always dealt with the ‘distance’ between people; that yearning, that sense of beautiful melancholy that is so very Japanese. Be it the physical distances of time and space in his debut Voices of a Distant Star, or the gulf of age and status in The Garden of Words, a common thread joins his films, one that he revisits once again in his latest. 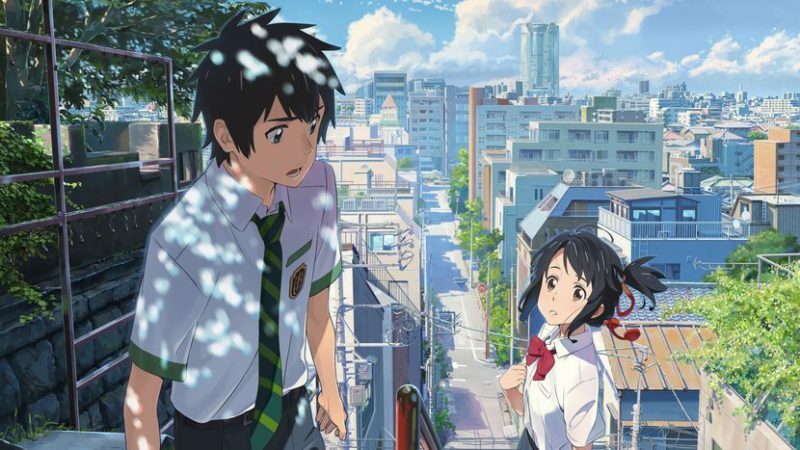 But sadly, while Your Name deals in familiar ideas, its approach is strange and jarring: while Shinkai’s films have always flirted on the boundary between underplayed and over the top, Your Name sees him launching into full-blown melodrama. Your Name is Japanese Animation as Saturday morning cartoon, more Naruto than Nausicaa, so far removed from what you expect to see in Official Competition at a film festival that its inclusion is downright puzzling. Initially, there is a lot to like. Shinkai (who wrote as well as directed) manages to find new ideas in the well-trodden ‘teen body swap’ genre: Mitsuha, a girl growing up in the small town of Itomori, wakes up one day to find herself inhabiting the body of Taki, a boy living a thoroughly different existence in the big city of Tokyo. Every other day Taki and Mitsuha swap, leaving them the remaining day to find out what mischief the other has got up to using their body. Soon aware of each other’s existence, they begin leaving messages for the other to find once back in their own body. And so, a kind of stilted, turn-based communication emerges, and the beginnings of romance. The idea quickly spins off into a tale with far higher stakes than you could possibly imagine, but it’s smarter than you’d think, along the way pulling off at least one more neat twist in a genre I’d thought done to death. However, Your Name is presented in a particular style that not only fails to do justice to these ideas, but actively works against them. The film contains at least a couple of super-fast, J-pop filled montages, covering vast amounts of time and character development in a minute of brightly coloured, popcorn silliness. All of the ideas I spoke of in the previous paragraph – you don’t really see any of those happen, one of the characters just says they happen while you watch a montage of high school kids running and screaming. It’s all extremely Young Adult Fiction, which isn’t a problem in itself, except that the film uses its glossy, bubblegum presentation in lieu of spending time building a relationship, giving us a reason to care. This is exemplified in the film’s closing act, where stirring power ballads and moist-eyed confessions of love screamed across mountaintops abound without the legwork to justify them. The net result is a movie that – and this is not an easy thing to write about a director I’ve long respected – is somewhat embarrassing for an adult to watch. It would be easy to write it off as a case of ‘Not Aimed At You’, but it’s not as simple as that: Any story, regardless of who it’s aimed at, has the same responsibility to make you invested in its drama, to make you believe. The obvious love and care that’s gone into Your Name only make this fact worse: this is a beautifully animated film, with gorgeous landscapes and scenes of flowing movement and colour that are among the finest I’ve ever seen. It makes you long for a different cut of this film: One that took its time, that lingered with its characters, and made love a thing earned, rather than a thing inevitable. Your Name is teen fluff in an epic guise, wonderful to look at but not a whole lot more. In the past, Makoto Shinkai has found himself being hailed as the ‘next Hayao Miyazaki’. He has always called those comparisons an “overestimation”. This time, sadly, I think I would have to agree with him. This entry was posted on Thursday, October 13th, 2016 at 10:28 pm	and is filed under Events, Features, Film, Review.